The guts. The glory. Enough chicken wings to fill a football field… or three. Super Bowl Sunday has something for everyone, which is why it’s the perfect excuse to throw a party! And it doesn’t have to cost you big bucks. In fact, you can get your house football-ready for cheap—or even for free. Find items that are lying around the house, or use stuff you’ve borrowed or bought second hand. Want to host a winning Super Bowl party? Keep reading! 1. Make your guests feel like champions by rolling out the green carpet. It’s easier than it looks! All you need is a bed sheet, a bath towel or a plastic tablecloth in any shade of green. Lay your “carpet” of choice on your walkway, then create the yard lines with masking tape. Make sure to secure it with some duct tape or stake the corners down into the lawn. 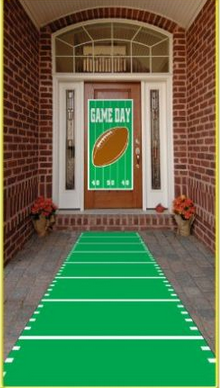 Your guests will feel like they’ve scored a touchdown before they’ve even entered your home. This set can be purchased from Birthday Express, but it’s easy to recreate for free with items you already have at home. 2. Be the MVP with football-themed coasters. Everyone needs a place to set down their celebratory (or sorrow-drowning) drinks! 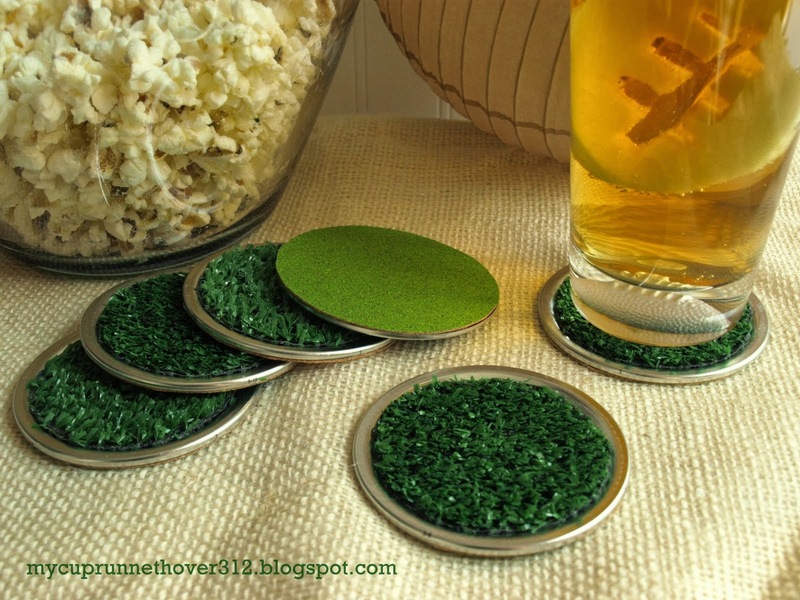 It just takes some mason jar lids and a few other supplies to make these football turf coasters from My Cup Runneth Over. For some extra football flair, decorate the mason jars with construction paper to make them look like footballs, and have fun using them as utensil holders. 3. Get the food into the game. 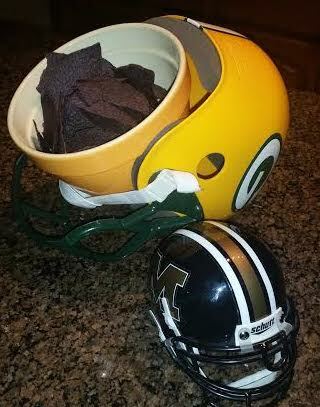 Have a helmet double as a snack bowl. Don’t own one? Ask your nephew or a neighbor whose children play pee-wee football. If you don’t know any football players, grab one for cheap on a buy and sell site, and then convince your kid to be Russell Wilson this coming Halloween. Note: For sanitary purposes, you probably want to place a bowl inside of the helmet first. Nobody likes sweaty-smelling potato chips. 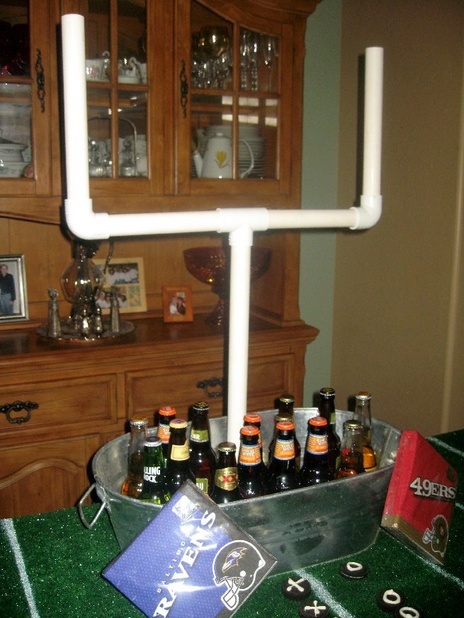 If you have some old PVC pipe laying around in the garage or basement, follow the tips at Help from Haley to fashion the pieces into a goalpost and bring some team spirit to your drink tub. Go the extra mile by using straws to make mini goalposts and stick them into dips, cheese balls and cupcakes. 5. Look like the star quarterback. 6. Give your guests something else to root for. Not every Super Bowl game turns out to be the kind of nail-biter that makes for a truly entertaining night. Luckily, there is one thing everyone can get behind: the commercials. 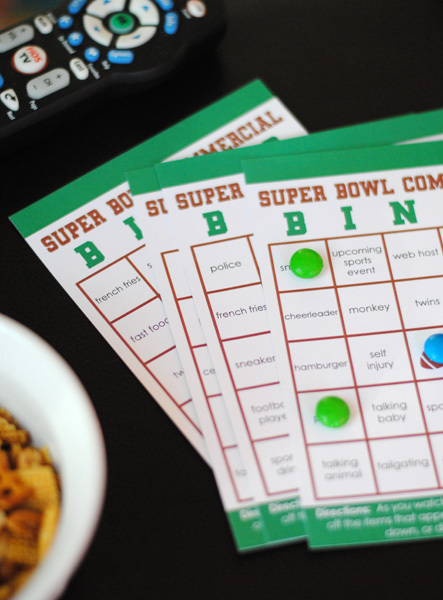 It’s easy to make watching them just as high stakes as the game itself with some Super Bowl Commercial Bingo. Just fill in the Bingo grids with popular advertisers, or create categories like “monkey cameo” and “made me cry.” You can also find printable cards (that are free and ready to go), like this one from The Flair Exchange, just about anywhere on the internet. The first guest to get five in a row wins! No matter the outcome of the game, creating a football-themed environment is sure to be a crowd-pleaser. Bring your A-game, and you won’t have to worry about those quarterbacks critiquing your party come Monday morning. Next articleVarageSaleVarageSale is 2014 Startup of the Year!